How can you not buy a cookie from a kid with a smile like this? Wow. It has been really busy. In the beginning of the year, I made a promise to myself to improve the balance among my kids' and husband's needs, my own needs, and the other "stuff" that needs to get done. As part of my personal fulfillment, I have been getting involved in more things: things that I am passionate about like yoga and teaching, and many things I am doing because they are the right thing. In April I definitely felt the surge in the number of activities on my priority list. Suddenly I find myself trying to squeeze in lesson-planning, exploring grants, and writing sponsor letters into an already busy week. I'm on hiatus from jogging (my saddlebags definitely know this) so I can write during those quiet early hours. Yoga -- thank goodness for yoga -- has been pushed up the schedule to 5:30am and weekends so that I have more time to help at Ryken's school. By adding more "me" activities, the kids are definitely getting less choice in what they do with their time. It's true that our family does a fair share of running around -- school, a couple of afterschool classes, library storytimes-- but I have always been an advocate of having a good amount of unscheduled time. And lately I feel like "our schedule has us," not "we have a schedule". Kids need to do things that make them feel balanced in their lives, too, As much as adults, kids need time to decompress from their days. When my kids come home after school, they love to relax with toys, books, drawing, and board games. I can tell when they are thoroughly enjoying their down time by the lengthy periods of quiet time and the soft clicking of Legos and Trio blocks and the intermittent squeaks of busy pencils. But they've been getting less of this lately. Springtime is here! Sunny days, April showers, gusty winds...a combination for a turbulent season for allergy sufferers. And about a week ago, they really flared up. Immediately upon waking, sneezing, itchy eyes, scratchy throat. Not fun. You never know if what is affecting you will adversely affect the kids, too...until it does. Yesterday, two out of the three kids had itchy eyes to the point of swollen eyelids and the inability to keep their little paws off their eyes. It's time to restock the antihistamines and allergy eyedrops! And yet...I love flowers. As our seasons are a bit subtle in San Francisco, blooming flowers are one lovely indication that spring is upon us. If I could afford it, or better yet, if I had a green thumb (which unfortunately I do not), my house would be filled with freshly cut flowers in every room. Oh yeah, and if everyone weren't so darn allergic to pollen! Luckily, we don't need to bring flowers into our homes to get our flower fix. Last year, we made tissue paper flowers. 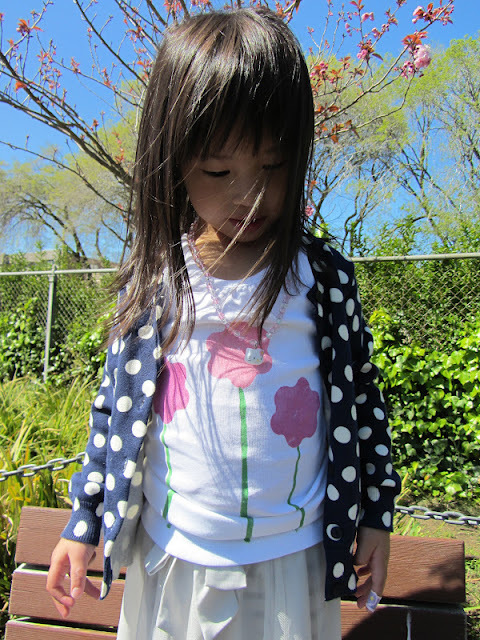 This year, I'd always wanted to try potato stamps, and the other day, Addison and I had a chance to add some flower tees to her spring wardrobe. It was so much fun and a great chance to get creative! If you're not ready to experiment on a tee shirt, just grab some paper and start stamping! 2. 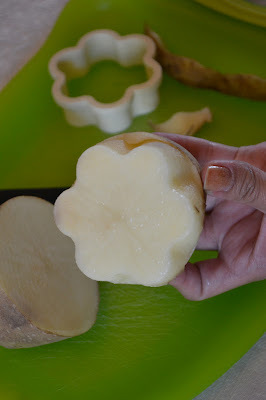 Place the cookie cutter on the flat side of the potato and press down firmly. Once the cookie cutter is stuck into the potato, you can place the cookie cutter on the table sharp side up and press the potato down onto it. Edges around the cookie cutter should fall off or start to peel away--just peel the rest of it off. 3. 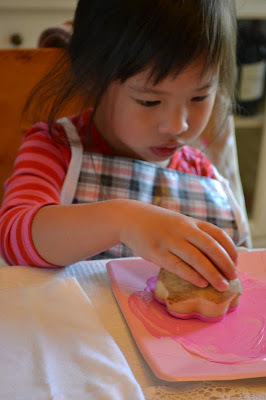 Once the edges are clean, pull the cookie cutter off, and voila--you have a potato stamp! 4. We poured paint onto plates and dipped our stamps, doing a few test runs on paper before stamping the shirts. It will help you locate any slope or uneven surface on your stamp that you may want to account for when you're trying to get the best print. Just rinse off with water and pat dry if you plan on using different colors with the same stamp. 5. We stamped a bunch of flowers and used the paintbrush for stems. 6. Use fabric glue and glitter, buttons, ribbon, or tulle to embellish your tees. So pretty! We had our long-awaited spring break at the beginning of April. 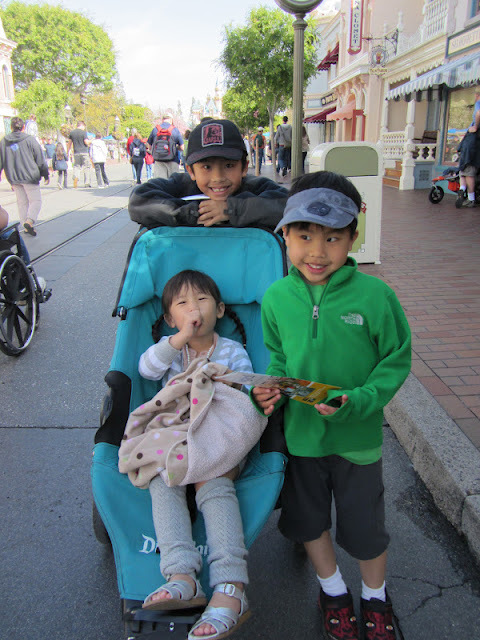 Unlike our usual vacation days in L.A. when we stay with the grandparents, we decided to focus our week on pure kiddy fun and go to Disneyland, California Adventure, and Legoland. I had visions of cooking our meals at my brother's place where we would stay near Disney and in a kitchen-equipped hotel in San Diego. My dear husband, however, pointed out the benefits of a true vacation for all of us. So we committed to the idea of little or no cooking. 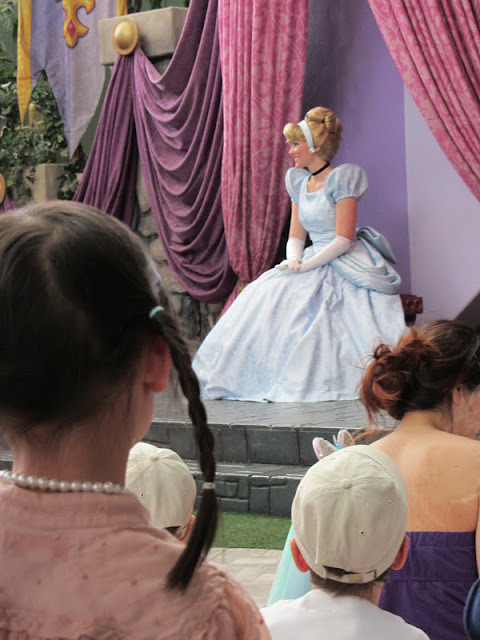 I have heard some wonderful things about the way food allergies are accommodated at Disneyland and Disney World Resorts from message boards, bloggers, and Sarah. 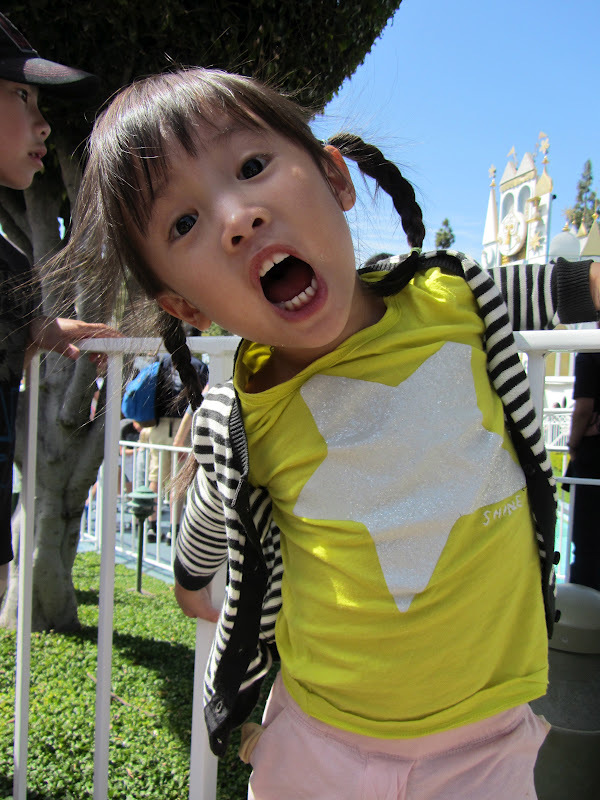 I called Disneyland's special number for discussing special dining needs. Within three days Chef Chris Justesen returned my call. Chef Chris explained how experienced Disney managers, chefs, and "cast members" are with meeting the needs of people with food allergies and sensitivities in their sit-down restaurants. I was told that no advanced reservation or planning of the kids' meals was necessary. I could simply inform a cast member or manager about our food allergies and figure out safe food choices right then and there. By contrast, quick-service "fast food" meal choices are one-size-fits-all with no customizing (because then it wouldn't be "fast" food" right?). Chef Chris did not have any ingredient lists for the quick-service meals and, according to other bloggers, food servers were not privy to the ingredients in the meals they were preparing. 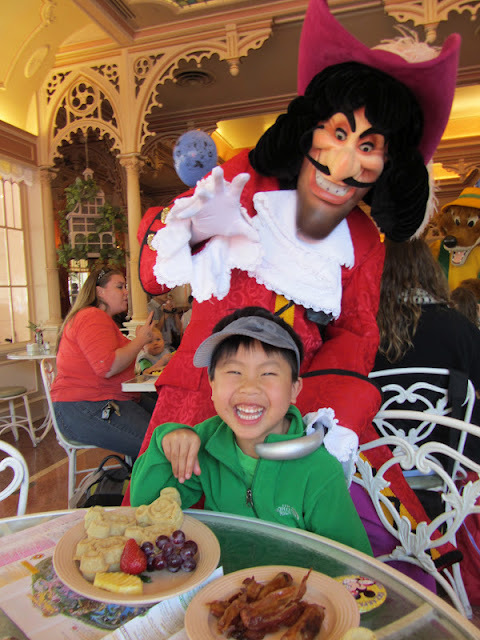 I can see how relieving it for food-allergy parents to know that they can work with managers to come up with safe meals within Disney restaurants. But for me, the "go-into-any-restaurant-and-we-will-work-with-you-on-the-spot" felt a little too risky for me. It's hard for me to let down my guard. Maybe this is because my boys are highly allergic to milk and milk is everywhere in American foods and popular kid fare (think pizza, buttery pasta, mac 'n' cheese, hot dog buns). Also, I always avoid giving my kids anything deep-fried. Some restaurants repeatedly deep-fry foods in the same oil. If you order fries, it could have traces of someone else's order of fried mozzarella, for example. Avoiding deep-fried foods means that chicken nuggets, french fries, and corn dogs are always off limits. Incidentally, these choices sometimes already contain milk! I decided I was more comfortable with skipping Disney park food altogether and sticking with foods that we were used to eating. Besides, quick bites to eat anytime we needed them are more our line-waiting, park-hopping style! We brought in our own lunches, ice packs, and snacks into the parks everyday. It was a Trader Joe's week for us as we had a steady supply of Trader Joe's ready-made turkey club sandwiches (milk-free but not egg-free), granola bars, hard-boiled eggs, bagels, and sliced fruit. We brought cookies by HomeFree Treats and Mary's Gone Crackers as special snacks. We made sure to stick with foods that the kids had eaten before without any incident that had the greatest chance of winning over our sometimes picky eaters. We did buy some apples, juices, and dried cranberries at Disneyland. It was encouraging to see that Disneyland had packs of hummus and veggies and fresh fruit for sale. We brought our Epi-Pen Twin Packs, Benadryl liquid antihistamine, and wet wipes everywhere. We also had our doctor's note regarding the necessary access to safe foods should we get stopped by bag-checking park personnel. We had no problems bringing meds or food into any of the parks. We had Select Wisely allergy translation cards in Thai, Chinese, and Spanish so that we could better communicate the kids' special needs. Translation cards for food allergies are worth every penny. You can buy allergy alerts that enable you to display translated alerts on your smartphones. But I strongly recommend having a physical copy that can be handed directly to chefs. We pulled our cards out every time we ate out and I felt worlds more comfortable with our dining experiences. It did take us a couple of tries to find a restaurant for safe dinners. Except in one instance at a local restaurant where lactose-free milk was used in a soup dish, we have always had luck with Thai food. Yes, it's true that a couple dishes do use peanuts but the peanuts are limited to garnish for a couple of dishes (salad and pad thai) or in peanut sauce that is served on the side. We checked out Yelp reviews and settled on a Thai restaurant close to Disneyland. However, after discussing the food allergies and ordering our food, I insisted that the server show the chef our Thai-translated Select Wisely cards. Were we ever glad we did! The server quickly returned and informed us that the restaurant uses peanut oil to cook their dishes. Obviously we couldn't eat there. My husband quickly found another restaurant on his smartphone, talked to the server about our kids' food allergies, and was assured that peanuts were only used as garnish for pad thai noodles and in their peanut sauce which is already-made. Peanuts are not used anywhere in the cooking process. This is what we were used to so we quickly gathered up the kids and headed to the new restaurant, Select Wisely cards and allergy medication in hand. We had the exact server who spoke with my husband and the experience was friendly and safe! We went back there again after our second day at Disney. After all, it's hard to find restaurants that you can trust. We chose accommodations with a functional kitchen so that we could prepare meals. Reducing the number of restaurant or fast-food meals meant fewer chances of cross contamination and less risk of allergic reactions. We stayed at the Homewood Suites Del Mar which offers apartment-style accommodations. 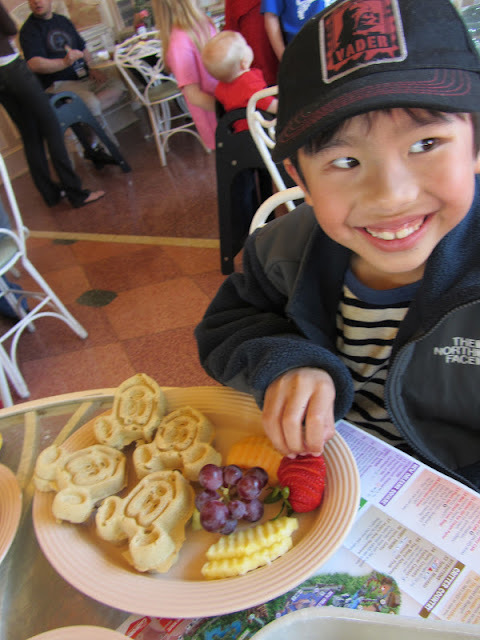 We had breakfasts and a dinner in our suite -- perfectly relaxing bookends to our busy daytimes at the theme parks. We did venture out to a Japanese restaurant for one of our San Diego dinners. We gave our server the allergy alert cards and spent time explaining about the extent of the kids' allergies and the need for chef knives, cutting boards, and utensils to be completely clean for our order. We ordered a noodles and broth dish and steam dumplings -- not deep-fried as the same oil could have been used to deep-fry sushi and wontons with cream cheese. We always avoid ordering rolls made with imitation crab, a kind of mystery meat whose blend can contain milk. (Imitation crab often contains egg and wheat, too.) When the server brought out our sushi, she detailed the care with which the sushi chefs prepared the rolls so that no cross contamination would occur. We were grateful and felt comfortable with letting the kids try their first raw sushi. Ryken enjoyed the salmon roll! 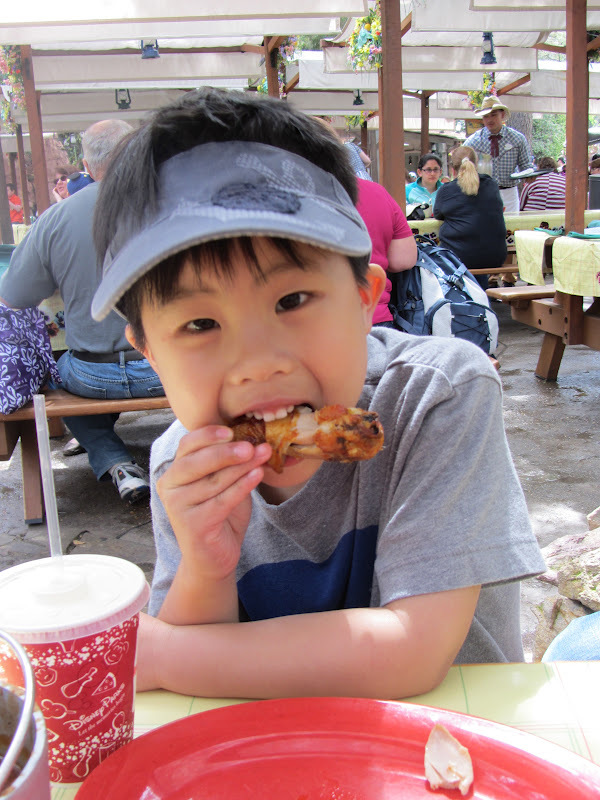 Legoland does have an online allergen guide to help visitors with food allergies and special dietary needs. However we stuck with our Trader Joe's foods for the kids. The park didn't even search our bags or stroller. My husband and I did visit the park's main food court and we get some shrimp pasta which I was told was dairy-free. The server, however, offers to sprinkle parmesan into the finished pasta while it's still in the pan so it appears there was no protocol for preventing cross contact. In this quick-service food environment there was no cleaning of hands, utensils, and grills after each use to ensure that traces of foods don't get on other orders. I did at least see pre-packaged bags of gluten-free chips in the food court. The weather was mostly sunny throughout our week. We slapped on hats and slopped on sunscreen each day. We recently made a switch to Vanicream sunscreen, recommended by our allergist and highly rated by the Environmental Working Group for safety, and have been happy with its gentleness and effectiveness. No sunburns and no skin irritation so far! All in all, our family had a terrific vacation. We managed everyone's stress by not cooking and by sticking with familiar foods that would minimize the kids' risk of allergic reactions. 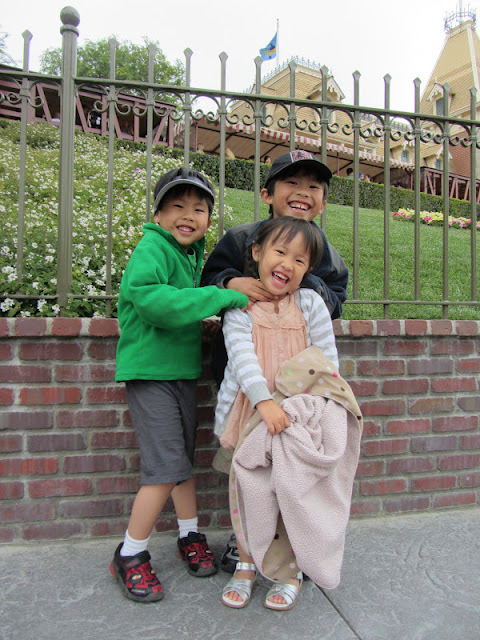 The kids had a blast at the theme parks and didn't bat an eyelash at the fact that we avoided park food. We hope to take another 5-day trip to the theme parks before our boys outgrow the tamer rides of Legoland and start demanding roller coasters! Eat them warm with safe butter and jam. Don't forget your cup of tea! It's getting warmer in our part of the country. It's perfect weather for relaxing in the sunlight with a cup of something soothing and a warm scone. Remember to double check all labels to ensure that your brand of ingredients are in fact allergy-free (gluten-free and soy-free can be especially tricky). Combine dry ingredients in medium mixing bowl. Create a well in the middle of the flour for your wet ingredients. Add melted coconut oil and quickly mix it by hand with the flour mixture. Add vanilla and 1/4 cup of hot water. Mix until halfway combined. Add in half the blueberries. Gently stir or cut blueberries into dough until just combined. I switch from a spoon to my hands to gently knead in the blueberries a couple times. Add in the remaining blueberries and knead a couple more times. You may need to add another tablespoon of hot water if your dough is too crumbly. Don't overmix or the scones will have a tough texture. Shape dough into a flattened circle with a 1.5-inch thickness. Cut the circle into 6-9 equal wedges. 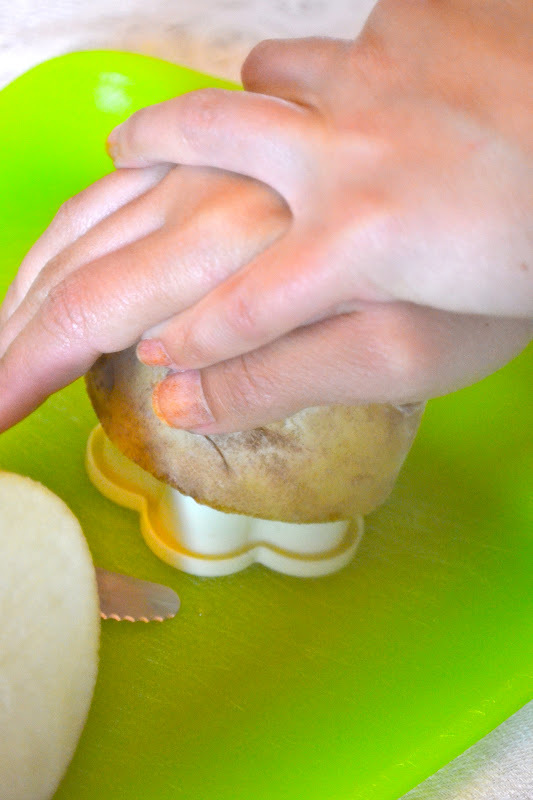 Pull the wedges apart and space them out on a greased cookie sheet. The trickiest part for me is to not overmix my dough. I'll be truthful. In one batch, everything was perfect, but in a subsequent batch, the texture was a little tougher, sure signs that I had mixed a little too much. I think I kneaded the dough several times to get the blueberries to stick to the dough and, in doing so, toughened the dough. In the instructions above, I suggested to add the blueberries in a little earlier when the dough is halfway combined. I also think working with dried fruit such as cranberries would make it easier to avoid overmixing. I found an informational piece about scones published by the Baking Industry Research Trust. It's worth the read. Not only does it go through the history of scones and details its common ingredients, it offers baking tips to ensure that you make a perfect batch. I pride myself in staying well even when the whole clan is sick. There I am, wiping up noses all day, tossing out wads of dirty tissues, getting coughed at--yes--in the face, and not getting sick. Well, last week was not one of those weeks. A fever, chills, and body ache knocked me out for four whole days, and little by little, I watched as the contents of the fridge and freezer dwindled, leaving behind several small plates of leftovers, many of which had become unrecognizable, some expired fruits and veggies, and a few bags of food I keep in the freezer just in case. From the depths of a usually overpacked freezer, I pulled out the Korean dumpling-inspired CJ Mini Wontons (Chicken and Cilantro) I picked up at Costco on my last visit. On almost every grocery shopping trip, I find myself pulling a few new-to-me products from the shelves and reading the ingredients, in case one would make a good candidate for a new staple at our house. I especially love finding healthy frozen foods. If anything makes my life easier, it's foods like this--not having to sacrifice taste, healthfulness, or cooking time is a real treat. They cook up quick and easy. Just pan fry with some oil and steam with a bit of water, or boil, or even microwave! So the next time you're at Costco, look for these in the freezer section. They're definitely worth a try, and have officially become a staple in our freezer from now on. Cherrybrook Kitchen is a company co-founded and inspired by Patsy Rosenberg, who developed food allergies to milk, eggs, and various nuts in adulthood. The husband-wife company makes allergy-friendly baking mixes with recipes created by Patsy herself. Their products are manufactured in dedicated dairy-free, egg-free, and nut-free facilities. They also offer some options that are gluten-free and soy-free. I love to bake from scratch and usually make my own cupcakes using the good ol' Wacky Cake recipe or a favorite vegan vanilla recipe. However, for my 4-year-old's recent birthday party I was planning to prepare most of the lunch myself so I knew some shortcuts would be welcome. I decided to try Cherrybrook's gluten-free chocolate cake mix and ready-to-use vanilla frosting. To make the cupcakes, you need to add water, oil (I used canola), and vanilla extract to the mix. Each box can make about a dozen cupcakes. Lucky me, I was able to get 15 cupcakes out of it. Back in the free-wheeling days when I didn't have to buy allergy-friendly and didn't pay attention to preservatives, I would pick up a box of Duncan Hines or Betty Crocker cake mix on sale for $1 a box. No doubt you'll never find Cherrybrook Kitchen mixes that cheap! With one box of mix priced at about $6 and frosting for $5, you're looking at a little less than $1 per cupcake. Not bad for allergy-friendly cupcakes as specialty allergy-friendly bakeries charge $3 or $4 per cupcake. The cost of the mix cupcakes was a good price but the real question was whether they tasted good. I thought the cupcakes were okay. Not spectacular and not horrible, but just okay. The cupcake seemed to have a nice chocolate flavor but at the same time it tasted a little chalky, as if the cocoa hadn't quite blended in with the rest of the batter. Texture-wise, the cupcakes were on the dry side. They were noticeably denser than a regular flour-based cupcake. I wonder if coconut oil or Earth Balance might help to add some needed moisture into the mix. As for the frosting, it was pretty disappointing. Instead of having a stiff consistency, it was extremely gooey and runny right out of the jar. My future sister-in-law who helped me frost the cupcakes found it to be challenging to keep the frosting from dripping off the sides. The taste was okay but I wish the frosting would have been fluffier (like the picture on its label) to help showcase the candy sprinkles. It's nice that Cherrybrook Kitchen offers this mix as there are so few options out there for people with multiple food allergies, especially wheat. While it was far from the perfect cupcake, it wasn't completely horrible. Next time I think I will set aside some time for my usual homemade baking. Aviator glasses from Uncle Gene. Photo courtesy of Joyce Cheng. Recently we celebrated my youngest son Callan's birthday with a party at home. I won't lie to you. Several weeks before Callan's birthday, I found myself lacking motivation to throw a shindig. I felt like the house and I were just starting to recover from the long stream of holidays -- Thanksgiving, Christmas, Chinese New Year, Valentine's Day. "Do we really have to have a party? Can't we just skip this year?" I whined to my husband. My husband shook his head and added, " I think the kids now expect to have a party every year." I was disappointed in his response and the idea that my kids had these lofty expectations (based on previous mommy-organized fun parties, but still) and that I was responsible for fulfilling their party fantasies every year for more than another decade. Cooking and cleaning up 3 meals a day, doing laundry 5 times a week, bath times, toothbrushing, swim class, and homework help were already must-dos. Did I really need to add annual party planning on the Mommy's Responsibilities chart? After getting over the initial intimidation, I knew having some sort of party would be really wonderful for Callan. He's really become a social butterfly over the past year and he would love having friends over. A party would also be great for the whole family. We have some amazing, dear friends and getting together with them is always a great time. The first big question was where so I began to internally debate the pros and cons of an off-site party versus an at-home party. The great thing about having a party somewhere else is that the business or hosting site often handles most of the nitty gritty such as table settings, food and drink, entertainment, and cleanup. You can keep your hands relatively free of all those details and focus on catching up with guests. Sounds dreamy! But what I have found (or not found, I should say) is that all-in-one party places have very limited choices of the kinds of food they serve (it's pretty much only pizza) and they have strict policies that forbid you from bringing in your own food. Rats. That just doesn't cut it for my milk-allergic kids. Now I know you must be wondering what our egg-allergic family is doing for Easter this year. Well the answer is: not much. We've been so busy with trip after event after trip and getting back into the swing of things over and over and over. Not to mention Tristan's first standardized test is right around the corner, and both of us can't wait to be over and done with these practice test packets. We still have lots of goodies for you from last year, along with a new idea for a sweet Easter treat. Hopefully, you'll still find the inspiration you're looking for. 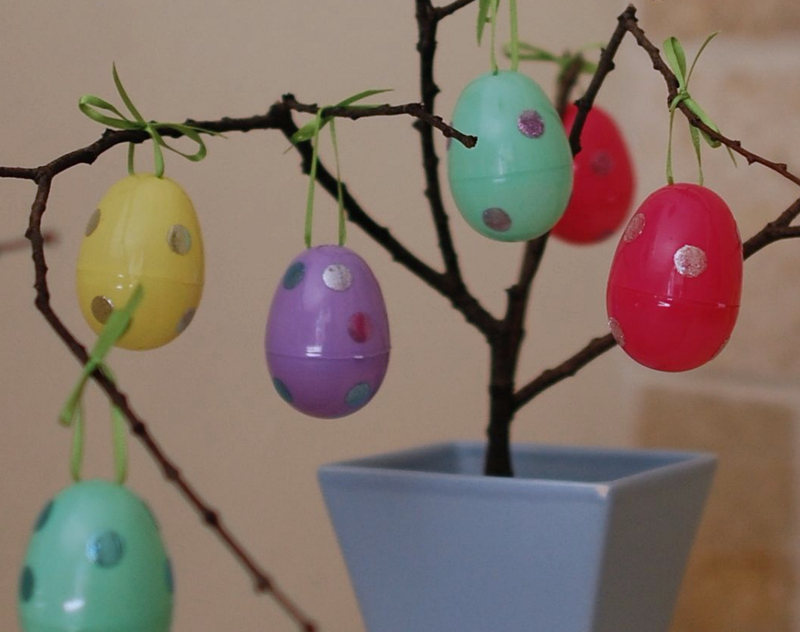 Last year, Michelle showed us how to glitter our plastic eggs, which proved to be a fantastically fancy and kid-friendly way to decorate eggless eggs. At our house, we thought up a few more ways to adorn our plastic eggs using stickers, stick-on gems, and decoupage, googly eyes, and felt. My hope was that this year we'd try out Eggnots, a new dyeable, ceramic egg, but I dropped the ball on that one, and will have to save it for next year. Last year, Irene made beautiful Easter chocolates, perfect for stuffing Easter baskets. I attempted some Rice Crispy Eggs using some extra plastic eggs I had as molds. The kids couldn't get enough of these. I was able to dig up an egg/nest project that Michelle had prepared for a baby shower we threw a few years back. I thought it would work perfectly for Easter, too. You can make them with just chocolate or a chocolate and soybutter (or another allergy-friendly butter) mix. Just melt about 12 oz of chocolate chips (we use dairy-free Trader Joes semisweet chocolate chips) with 1/2 c. of soybutter, and mix with a box of shredded wheat. 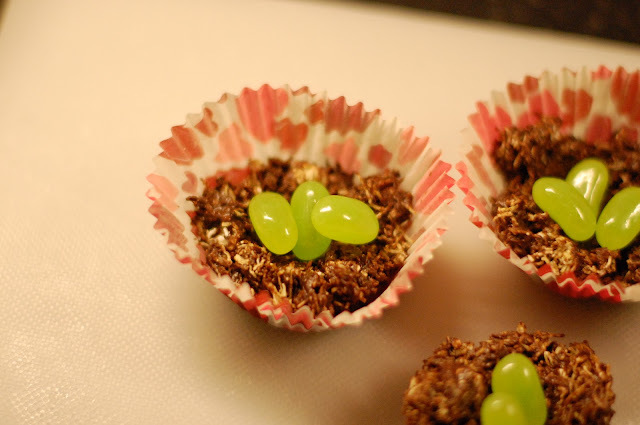 Line a cupcake pan with foil or paper liners and shape mixture into nests. Let cool. Add allergy-friendly jelly-beans. So you see, there is still plenty of time to whip up some egg-free treats for your cuties this Easter. Have fun and most importantly, try to spend some quality time with family! Yep. We did it. We packed three kids in the car and roadtripped it down to Anaheim for Spring Break. I am not a huge fan of driving anywhere with the kids that takes longer than three hours. And this is why (for those of you without small children): The first hour of the drive is usually filled with excited chatter and some family favorite songs sang nearly in tune (and besides, the caffeine's still pumping through my veins). The second hour starts several rounds of car games, including "I Spy" and anything else the kids can think up, along with the breaking out of a few cherished toys from their self-packed backpacks. The third hour, if kids are really getting antsy, is where we break out a DVD to be played for the benefit of everyone's sanity, and somewhere in the middle of the movie is where we arrive at our destination. This three hour travel rule usually limits the "Are we there yet? "'s, the "I'm hungry"'s, and the "My stomach isn't feeling so good"'s. So you can see how a 7 to 8 hour trip is few and far between. 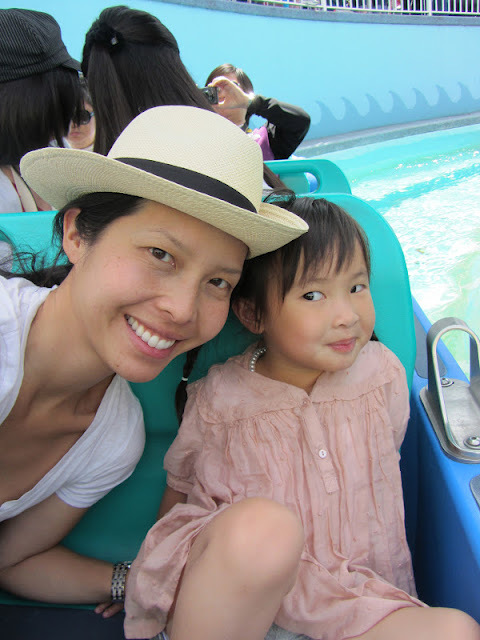 In fact, the ride down wasn't so bad after all (although I have to say coming back was harder), and it was awesome to see the looks of wonderment on the kids' faces during our two-day excursion to Disneyland. Best of all, we were able to eat two enjoyable, safe sit-down meals at the Park, without incident. 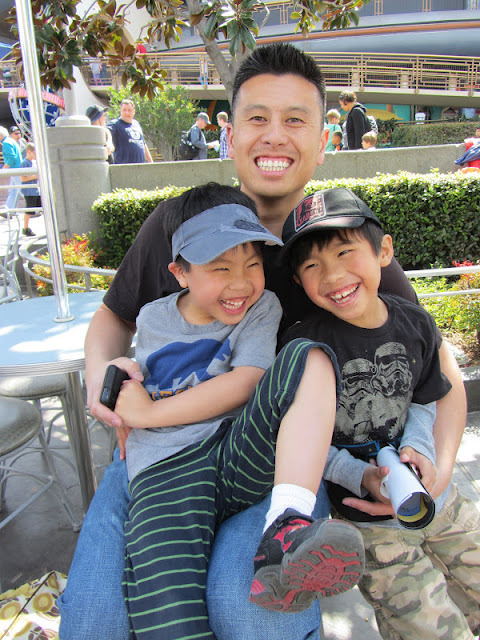 I had heard that Disneyland was allergy-friendly, so I went to a few blogs to see what their experiences were like, then checked out the Food Allergy Information section on the Disneyland site. Because I hadn't planned in time to make the 14 day advance special accommodations for multiple food allergies, uncommon food allergies, or multiple guests with food allergies, I decided to accept their other option and just book reservations through their reservation hotline, have the allergies noted on the reservation tickets, and speak to the chefs when we arrived at the restaurants. I wanted to have some sort of a game plan, but I packed extra food in case this option didn't work out for us. The Disneyland operator was very knowledgeable and patient, saying, "We deal with allergies on a daily basis." The reservation tickets helped the greet staff know about our food allergies. At one restaurant, I had to ask the server if I could call the chef over to our table to discuss food allergies, but at the other restaurant, the chef came out shortly after after we were seated. On day 1, we had lunch at Big Thunder Ranch Barbeque. The environment was casual and relaxing, with long picnic tables under a shady canopy, and ample waitstaff, who were super friendly and attentive (special thanks to our server, Tuesday!). The all-you-can-eat meal is served family style, and consists of a bucket of bbq ribs and chicken, beans, coleslaw, and cornbread, all of which my dairy, egg, nut, and shellfish allergic son could eat, minus the cornbread. And they've got a vegetarian option too: skewers with potatoes, squash, bell peppers, mushrooms, and tofu. Everything was tasty, although the kids complained of the meat being a bit "spicy." On day 2, we enjoyed the character breakfast at the Plaza Inn on Main St. I was pretty skeptical about having a buffet breakfast, of all things, with so many egg-based dishes, but it was wonderful! Based on the kids' food allergies, the chef listed the items that were safe to eat, and offered to make some gluten, dairy, and egg free waffles for the boys. Out came four Mickey waffles with a fruit assortment, free of any chance of buffet contamination. Tristan, particularly fond of waffles, was thrilled! I supplemented their breakfasts with sausage and bacon, which were served to us from the hot foods area. Aside from the allergy-safe food, the kids adored all the characters, who were silly and friendly, and knew not to startle Addi, who wasn't sure what to make of it all. 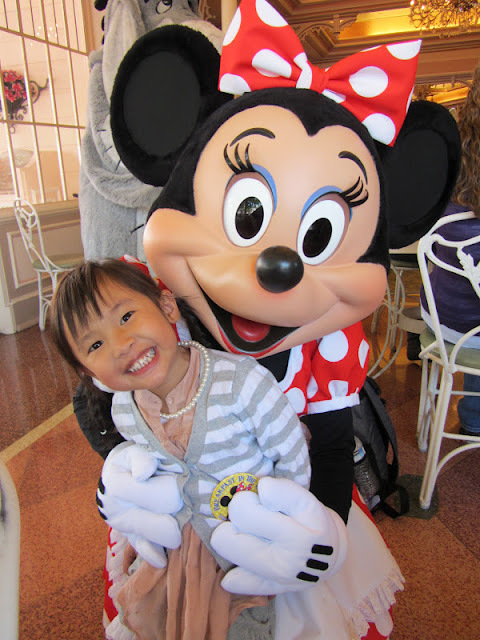 But once Minnie came around, it was all worth it. 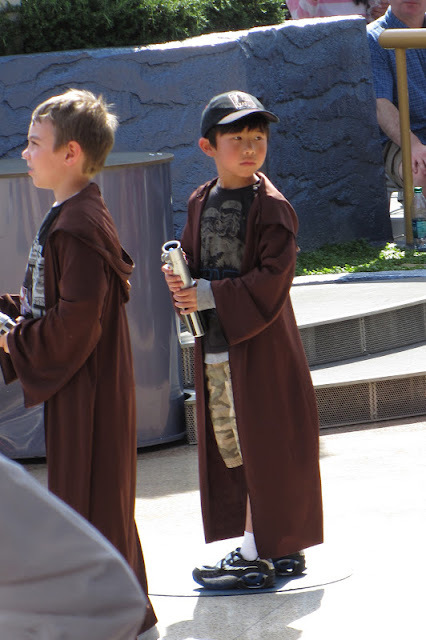 Tristan got to be a Jedi in Training, and practiced his lightsaber skills along with the other Padawans. Thanks Disneyland! We had a blast! Note: Please make sure to speak directly to chefs about your specific food allergies, as ingredients and menus may change without notice.